Got two weeks and only want to see the very best of California? This is the road trip for you. 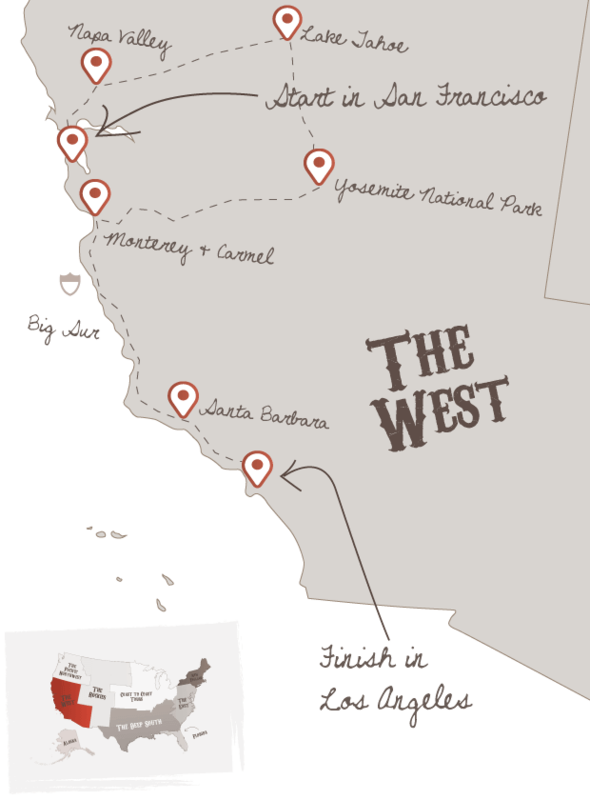 A classic national park, two classic American towns and the classic Pacific Coast Highway. That’s why this trip is called “Classic California”. This trip is an amazing mix of different experiences, only a road trip holiday offers such freedom and variety. California's best bits in just 2 weeks! Arrive in California, and take a convenient cab from the airport to find your hotel in San Francisco. Enjoy an evening meal in one of the city's excellent restaurants before settling in for the night, so you are ready and refreshed for two full days exploring in this wonderful city on the bay. Spanning the headlands of San Francisco and Marin County, one of the world’s most beautiful bridges is a delightful experience whether you walk, bike or drive across. You can see stunning views by driving up Conzelman Road on the north side of the Golden Gate Bridge. Crossing the bridge will take you to the rolling landscape that is Marin County. Here you'll find treasures including Tiburon, Sausalito and Muir Woods National Monument. It’s one of the two places that claim to have invented the Mountain Bike. You’ll then continue on until you reach Sonoma Valley and neighbouring Napa Valley. You don't have to like wine to enjoy this area. These two neighbouring valleys offer stunning scenery made up of perfectly manicured vineyards stretching across rolling hills that can be enjoyed by car or even on an early morning hot air balloon ride. This is food heaven too, with places like Thomas Keller’s French Laundry and the rather more affordable Gott’s Roadside burger joint. Additionally, you can take a drive along one of our favourite roads in California, The Silverado Trail parallels the St. Helena Highway passing through scenic wine country. You’ll follow I-80 and the Lincoln Highway to find the beautiful blue waters of Lake Tahoe and the mountains that surround it. Spend the afternoon kayaking on the lake, skiing on the mountains or just relax on one of the lake's many lovely beaches. If you fancy a drive, then you can circle Lake Tahoe along scenic highways in around 2 hours. Today you’ll cruise through Gold Country to the curvy roads that approach Yosemite National Park. Once in Yosemite, you’ll have 2 days to experience nature at its most breathtaking. Yosemite National Park is over 1180 square miles of nature at its very best. The most visited area of the Park is Yosemite Valley. Vast rock faces, crystal clear waters, staggering views and stunning waterfalls combine to make Yosemite a real national treasure. Leave enough time to visit Glacier Point, which is best viewed during sunset and offers the best views in Yosemite. Monterey was once California’s capital, however, today it's best known for the world-class Monterey Bay Aquarium that resides on Cannery Row. This town was also famous for its whaling and sardine industry, it now focuses on marine education and preservation through the world-class Monterey Bay Aquarium. In the early evening, cruise along the famous “17-Mile Drive” on your way to Carmel-by-the-Sea. You’ll pass millionaire mansions, Pebble Beach Golf Club and a beautiful rugged coastline along the way. Carmel offers two world-class beaches backed by a small town made up of beautiful homes, quaint streets and fabulous restaurants. The wild and wonderful Point Lobos is just a couple of miles south of Carmel. Here you can see sea lions give birth to pups on beautiful beaches, sea otters frolicking in the ocean and whales slowly migrating through the 750 acre underwater State Natural Reserve. Point Lobos offers pure beauty that can be enjoyed through the many short hikes, a wonderful afternoon indeed. The classic All-American drive down California’s Highway 1 is at its most dramatic when it passes through the 90 miles of coastal road that is known as Big Sur. Twisting roads curve around the steep cliff faces, occasionally passing gorgeous State Parks and spectacular vista points that look out over the vast Pacific Ocean. Further down the coast, Hearst Castle perches on “The Enchanted Hill”. If you're keen to visit here then an overnight in Cambria is key as there's a lot to see. Onwards to Santa Barbara, built in a charming Mediterranean style -making it one of the Central coasts best highlights. Spend the morning in sunny Santa Barbara, after lunch you’ll continue driving south along the Pacific Coast Highway passing Malibu’s beaches and coastal homes until you reach Santa Monica in Los Angeles. Santa Monica with its “Baywatch” beaches and old-fashioned Pier is a worthy finish to the day. Hire a bike and cruise the boardwalk down to Venice Beach or shop your heart out on 3rd Street Promenade. Tinseltown is synonymous with glitz and glamour, and although many of the studios have now moved on to other parts of the city, it's still fun to visit the home of the Oscars and walk Hollywood Boulevard looking for the handprints of your favourite movie stars. Just a short drive northeast of here lies the Griffith Observatory, perched high on a hill overlooking the city. The landmark is well worth a visit and is great for views of the legendary Hollywood sign. Beverly Hills offers the chance to see movie star homes with sky-high fences on palm tree-lined streets. Close by is the amazing Getty Center, this is a firm favourite of the team at The American Road Trip Company and your personalised Road Trip Pack will help explain how to visit this attraction and all the other essential places to see in La La Land. The next day you’ll fly home from Los Angeles International after spending the morning finishing off any sightseeing. Don't forget to check out this road trip's Itinerary tab to see more amazing pictures from our "Classic California" tour. You'll also be able to read a little bit about what you'll be getting up to on each day of this incredible road trip adventure.